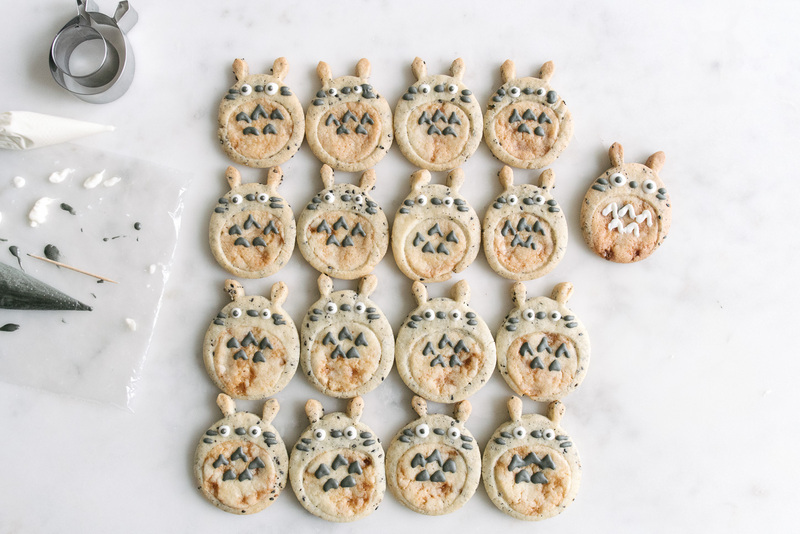 I’ve been wanting to make cut-out Totoro cookies for a while. 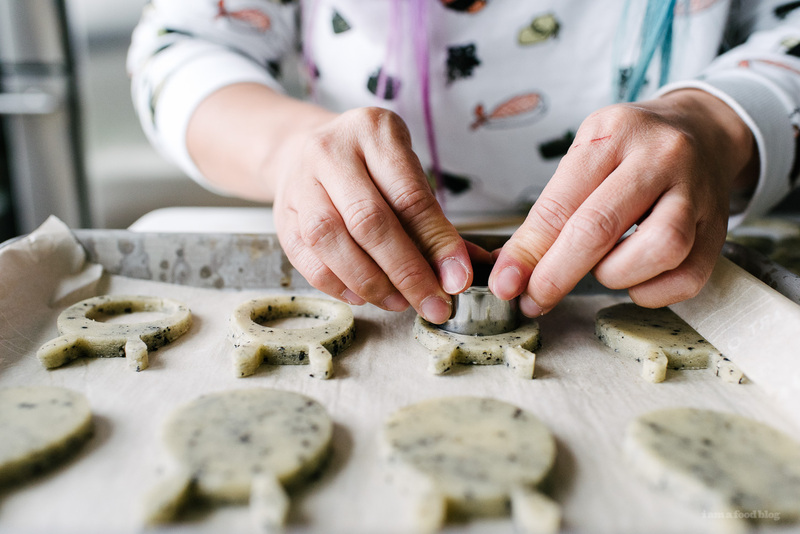 I’m in love with my Totoro cookie cutter. It’s a little on the smaller side, but that’s why I love it so much. 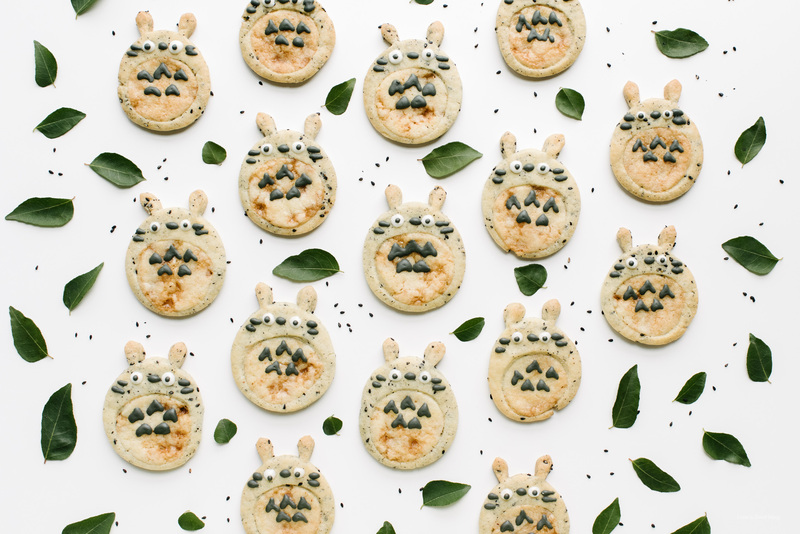 It’s perfect for using to make avocado Totoros, Totoro pancakes, and Totoro egg-in-a-holes. I’ve made so many Totoro things, but this is the first time I’ve made cookies with it, mostly because I’m lazy about rolling out and icing. 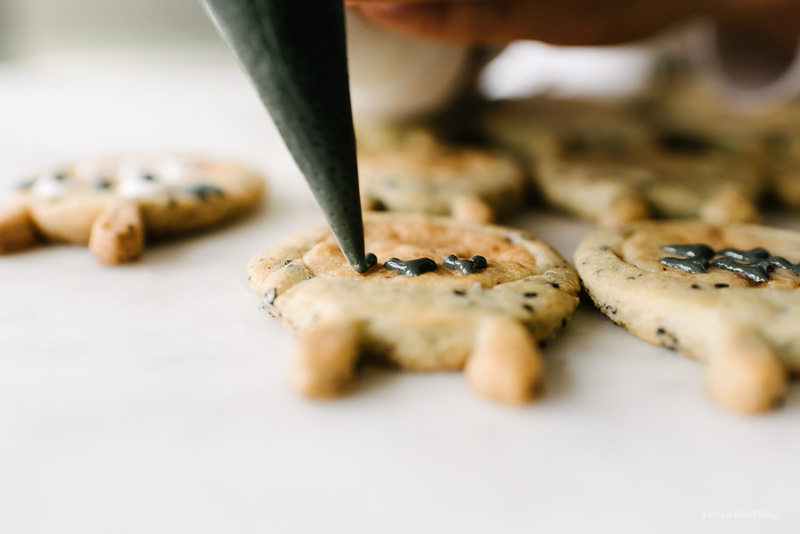 I was thinking of icing the entire tops of sugar cookies, but then I thought of using black sesame to dye the dough instead. Black sesame is the bomb: nutty, complex, and better than peanut butter! I’m all about sesame flavored things, probably because sesame flavored desserts were super common growing up – a lot of Chinese desserts are sesame based and I get just a bit nostalgic when I eat them. 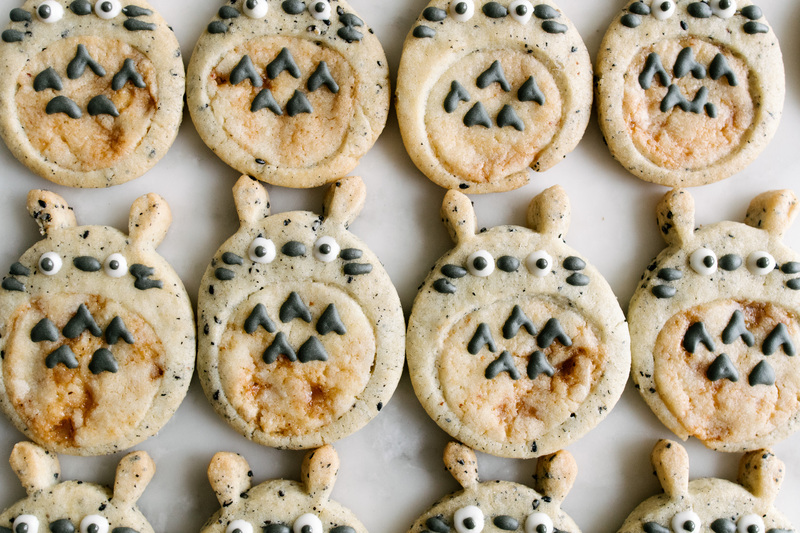 Originally I was intending for the Totoro outsides to be black sesame and the bellies just plain sugar cookies but I completely lost my head and added black sesame to all of the dough. I wan’t super concerned because I was totally down to whip up another batch of sugar cookie dough, but then I realized that I didn’t have any more flour. So, instead of heading to the store for more flour, which would have been the more logical thing to do, I remembered that I had some toffeedoodle cookie dough just chilling out in the fridge. Have you guys had toffeedoodles from Starbucks? They’re basically a snickerdoodle with toffee bits. I had made a batch to bake off for a friend, so I just took some dough, rolled it out and hoped that it would work. I did one little test cookie (you can see it in the lefthand side of the first photo) and it turned out so I went to town. These guys were awesome: the perfect combination of cute and tasty. I still can’t decide whether I like the toffeedoodle or black sesame cookie part better, but it’s all good because I have a lot of cookies to taste! You will probably end up with extra Toffee Snicker Doodle cookies – they’re delicious. Ball them up, toss them in cinnamon sugar and bake them at 400°F for 12 minutes. Roll out both doughs to about 1/4 inch. I like to roll out my dough between parchment paper or plastic wrap. While cutting out the black sesame dough, keep the toffeedoodle dough in the fridge, wrapped up, but rolled out. 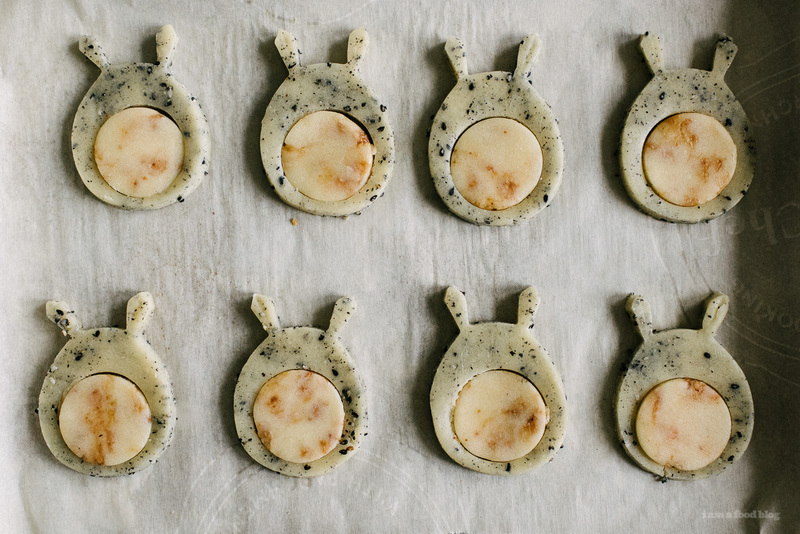 Use a Totoro cookie cutter (this is the one I have) to cut out the black sesame dough. Place on the prepared cookie sheet. Use a small circle cutter to cut out Totoro’s belly. Remove the belly cut outs and re-roll and cut out. Cut out belly shapes from the toffeedoodle dough. The toffeedoodle dough isn’t a roll out cookie so try your hardest to keep it cold as possible, working quickly. Place the toffeedoodle circles into the Totoro bellies. Place the cookie sheets in the fridge for at least 30 minutes. This will help them keep their shape while baking. 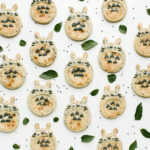 Bake Totoros for 10-12 minutes or until very lightly golden. Remove from the oven and let cool completely. Pipe on faces using white and dark chocolate. Enjoy! To measure out half an egg, lightly whisk in a bowl. Half an egg is approximately 1 1/2 tablespoons. Use the other half of the egg for the Toffeedoodles. Whisk the flour, baking powder, black sesame, and salt in a bowl and set aside. With an mixer, or by hand, cream together the butter and sugar until light and fluffy. Add the egg and vanilla. Slowly add flour mixture and mix until combined. Pat into a flat disk. Wrap in plastic wrap and place in the fridge overnight. Cream together the butter and sugar. Stir in the egg and vanilla. Mix in the flour, cream of tartar, baking soda, salt and toffee bits. Pat into a flat disk. Wrap in plastic wrap and place in the fridge overnight. so cute!!! i love the two-in-one cookie action going on here. This is beyond adorable! I need to make these!! These are adorable. And they’re like a hybrid cookie with those flavors! To make these, I will have to choose a time when I have a lot of patience to do all the decorating – not always my thing! The cookies look delicious! where did you get your sweater? I love it! These look amazing! I also love all things black sesame, I just can’t get enough of it! 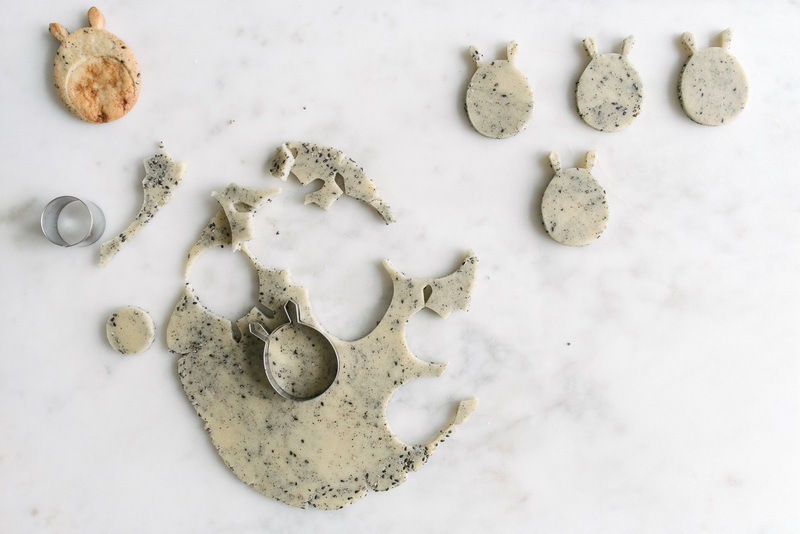 Would you be able to just make the black sesame cookies alone? If so, do you think baking time or anything would be altered? Just wanted to say that I did try making only the black sesame cookies this past weekend, and, unfortunately, they did not work at all. I followed the recipe to a T, and I consider myself to be a very experienced baker (I bake almost every week, and have made sugar cookies countless times before), so I can honestly only conclude that the recipe is somehow flawed. I had a bad feeling when I started mixing the wet ingredients together; it did not seem like nearly enough, and my suspicions only increased when I had trouble mixing it in with the dry ingredients. The dough was horribly crumbly, to the point where it wouldn’t even stay together at all, and the second I picked it up to place in the fridge it instantly crumbled. I had a small hope that resting in the fridge overnight would magically improve the consistency of the dough, but, as I suspected, it crumbled instantly upon taking it out the next day. I attempted to salvage it by adding little bits of cold water, just to make it sticky enough to try and roll and cut out shapes, but, in the end, the cookies really didn’t turn out (as you might’ve guessed). I feel as if there is something wrong with the ingredient measurements, and I do not recommend this recipe for the black sesame cookies. This really is unfortunate, as I have made many things from your website and they have always been successful, so I was baffled to discover this was a complete and utter miss. Yeah, sorry to leave the bad review (also, sorry this didn’t reply to your last comment… the reply button never works for me), I feel bad! It definitely could’ve been the amount of egg…. perhaps the egg I used was too small, even though I did measure it out to what you recommended. I am determined to try these out again though– my love of black sesame requires it, haha– so I will let you know if I end up making any successful adjustments. All about trial and error! All things said, I’m still a huge fan of your blog, and will definitely continue to try out all your great recipes! thanks for leaving your review shannon, please let me know if you do ever work it out and again, so sorry it wasn’t a success! i will definitely have to bake these cookies again, i’m not sure what happened. i’ll keep you updated!